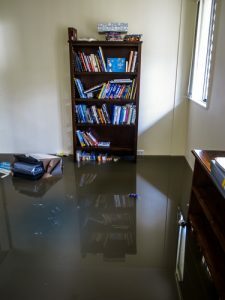 In case of water damage caused by a slab leak, flood or any other culprit, there are certain things you can do to protect yourself, your home and your belongings even before you call in a professional to curb the damage. We’ve already talked about what you should and shouldn’t do if there is excess water in your home because we often see people getting hurt and causing more damage due to fear and panic. Remember – your safety comes first. Once you’ve done everything you could to make sure there’s no further damage or threat to your safety, consider some practical things you can do to save as many belongings as you can. First of all, let’s not forget you probably have other things to attend to before you think about saving the books. In that case, you can simply put the books into a plastic zippered bag and into the freezer (if possible). This should give you just enough time to try and salvage other possessions and still prevent further damage to the books. When you have the time to dry out the books, follow these steps: Very wet books shouldn’t be opened, but instead placed in a well-ventilated room on a towel, separately. You should change the towel regularly until each book is partially dried. With partially wet books, you should insert paper cloths every 10 – 20 pages, and change them every two hours or less. When the books are damp, you can use the fan to dry out the leaves. Needless to say, you should only attempt to save the photos which you don’t have negatives for or you don’t already have stored online. Unfortunately, it’s unlikely that old photos and albums we keep for sentimental reasons exist online. Therefore, you may have to prioritize and see what’s really worth saving. Make sure you hold the photos by their edges. If there is enough time, rinse the photos with clean water and put them in a plastic zippered bag with wax paper between them. Freeze them like you did with the books until you have time to work on them. It’s essential that you do this quickly – you can defrost and fan dry them later on. First things first – make sure you have unplugged all electrical devices safely before doing anything else. Once you’ve done that, take the wet piece of electronics apart and leave it to dry. This may take several days. You should put the wet electronics in a heated room, but make sure you have a dehumidifier. Under no circumstances should you put wet or even only partially wet electronics into the microwave or try to fan dry them – you might cause damage to their internal components with excessive heat. Remember, there are only so many things you can do by yourself, and we can’t stress enough that you should leave thorough cleanup and damage restoration to licensed, certified and trained professionals. At KIC Restoration, we are glad to offer guidance and professional advice to plumbers and customers alike, but it’s also our duty to point out the importance of a professionally-handled cleanup. After all, when it comes to water damage, there’s more at stake than your belongings – the health of your family can be seriously threatened if the cleanup is not done properly. Don’t let that happen – contact KIC Restoration in case of an emergency and we’ll be there to restore your home to its sanitary state.